When you go for a walk or a run through your neighborhood, especially after dark, it’s in your best interest to stay on smooth, clearly marked, unobstructed paths. These well-lit and well-traveled routes help keep you safe. Your home’s ductwork is a reliable path through your home that helps your household to function smoothly. It allows hot and cold air to circulate properly through your indoor space, keeping you comfy and cozy. When trouble breaks out along the path, it can put your comfort at risk. That’s why it’s important to make sure there are no leaks, cracks or other signs of trouble in your ductwork. Your ductwork needs to be clean, well insulated and in prime condition. When your ductwork becomes old or worn out, it can create serious problems, including unpredictable and uneven temperatures throughout your house, poor energy efficiency and unhealthy indoor air quality. Air leaks and cracks can back your HVAC system into a corner, forcing it to work harder than it should. This results in energy bills that are out of control. Leaky ducts also allow a crowd of troublemakers such as pollen, dust and other pollutants to sneak into your house and wreak havoc. Is It Time for Your Ductwork to Retire? 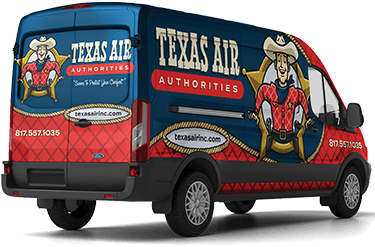 The good guys at Texas Air Authorities are sharpshooters when it comes to keeping your ductwork in tip-top shape. We’ll conduct a stakeout and come to your rescue when you need your ductwork repaired, replaced or sealed. There isn’t a case we haven’t seen—and solved. When the question is whether you should repair, replace or seal your ductwork, the crackerjack technicians at Texas Air Authorities are straight shooters. We’ll never try to talk you into a replacement when a reliable repair or sealing service is the wisest strategy. We will weigh all of the evidence and help you reach the verdict that makes the most sense for you and your budget. Age: Ductwork typically lasts 10 to 15 years before it starts to break down. It can hit the dust even earlier if inferior materials were used or shortcuts were taken when it was installed. Exposed areas: Look for holes or tears in the ductwork that you can visibly inspect, such as in crawl spaces and attics. Keep your eye out for eroded duct tape and disconnected joints, too. Airflow: Is the airflow adequate in every room of your house? Uneven temperature could be a sign of problems with ductwork.